This is not a sponsored post. This is a story of Twitter. Well, really, this is a story of fabulous design that just so happened because of the ingenious means of communication known as Twitter (did you ever read about Paige's amazing job she secured through Twitter?). I love having the ability to talk right to my favorite people and brands in a simple, concise manner. I've been following the witty posts of the Land of Nod for a while. Their blog Honest to Nod is always filled with cute ideas and beautiful designs that make me want to relive my childhood again and again. I am smitten with Land of Nod's combination of well crafted furnishings with quirky, life-loving designs. So when @thelandofnod asked if anyone had a design dilemma, I tweeted right back. And EEK! Danielle Kurtz (hello, Creative Director) asked me to send her an email to hear more. And what followed were numerous exchanges back and forth where I had the opportunity to tell Danielle all about my dreams for my son's new big boy room and where she authentically wanted to know more about my style, my son's personality, and see the space for future planning purposes. I'm so over-the-top excited with what she put together. You can check out the entire project on the Land of Nod's Pinterest page under L's Big Boy Room. Beautiful Danielle even linked up DIY projects that would fit well with my goals for the space (I hope to share these with you in the weeks ahead). We decided to purchase the Simple Twin bed and wide dresser for my son. 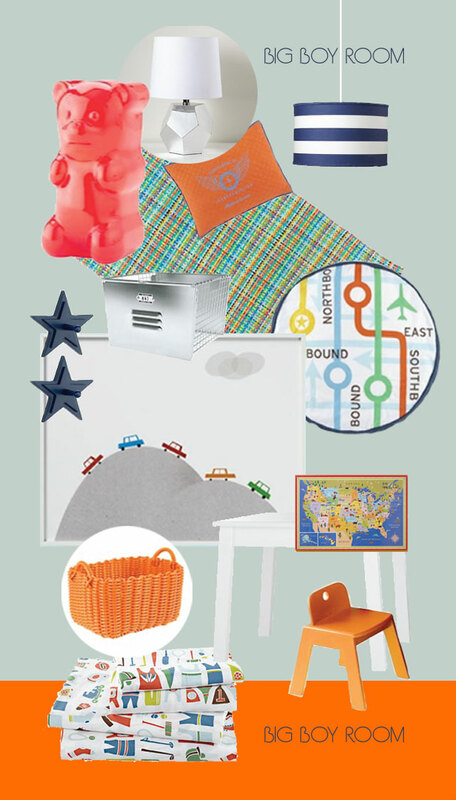 He's turning 3 in a month, and we wanted some Land of Nod pieces to get him started in a new big boy room. He's a bundle of energy. He loves cars & trains (right now). His favorite colors are orange and blue. We have purchased a madras plaid quilt with navy, green, and oranges in it. He loves stripes. He also wants a place where he can hang his artwork. And the whole thing makes me happy, from ear to ear. This is all so perfect for my son. My faves? That simple car print, that adorable orange chair, and the gummy bear nightlight...but I kinda like every single piece. And the color from Benjamin Moore, Palladian Blue has been in my sketchbook for a while now just waiting to fill one of our rooms. Yay! Since our money tree is not blooming this season, we'll make some great selections from the inspiration board and DIY/thrift/budget store the remainder. Have you ever had professional consultation on an interior space? Or has Twitter gifted you with something unexpected and wonderful? Can't wait to share more! !